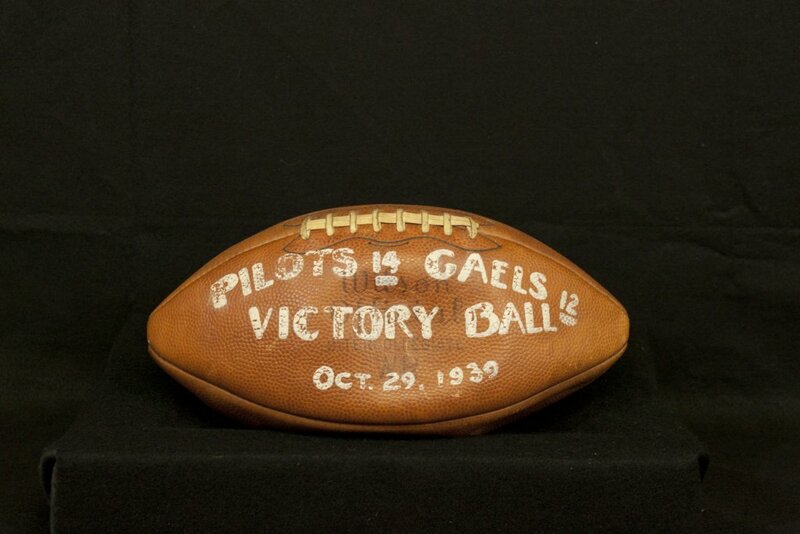 Although there were some games played in 1902, football on the Bluff really began in 1903 under Coach Albert Cronan. 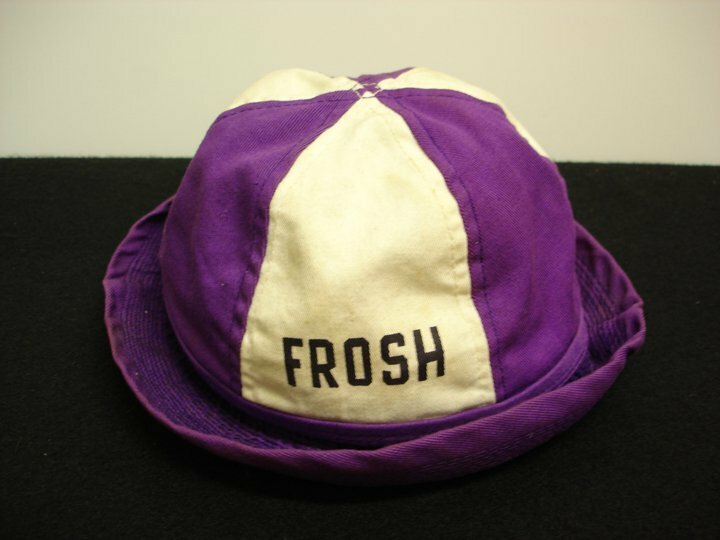 With such coaches as Frank Lonergan, Gordon Moores, Dom Callicrate, Bill Schmitt, Leo “Tic” Malarkey, Hughie McKenna, Ad Dewey, Edward “Slip” Madigan, Maurice “Clipper” Smith, Vince Harrington, and Gene Murphy, the Purple and White was always in the battle. There was a championship team, for instance, in 1913, an undefeated season in 1914, and a tie for the title in 1920. Worthy opponents were picked – usually the heaviest. There were years of transition, when teams were too light to play a regular college schedule but when high schools refused to play them. Scores of trophies still testify to the success of these Columbia teams. 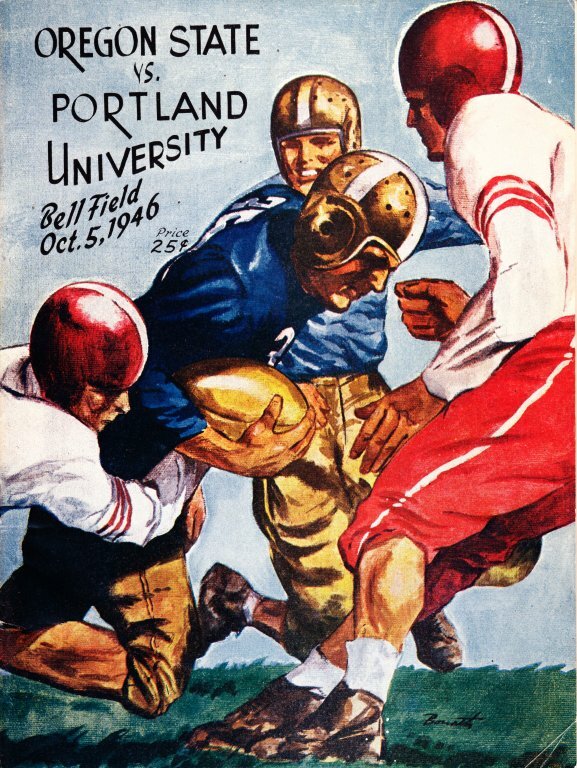 Genial “Gene” Murphy coached Columbia Teams from 1927 to 1934 (when they were known as “Cliffdwellers” or “The Irish”) and coached the University of Portland “Pilots” in the 1935 and 1936 seasons. 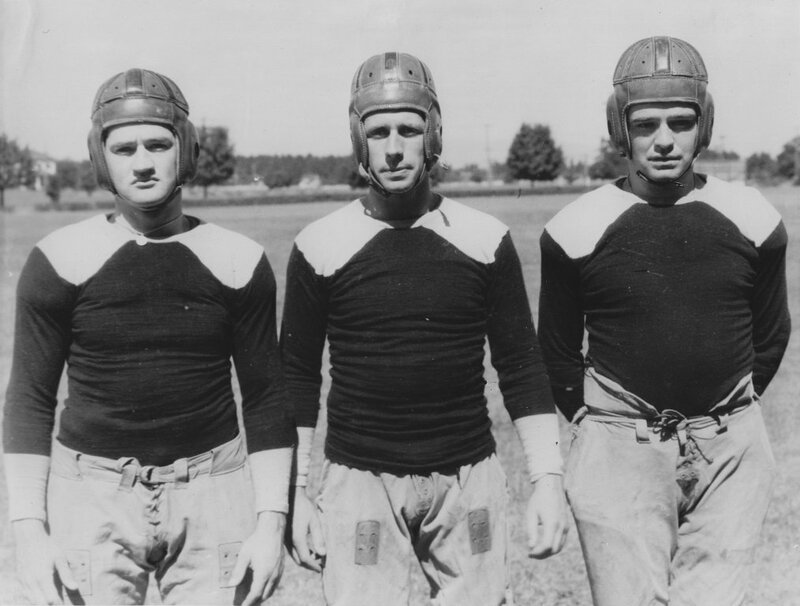 Robert “Matty” Matthews took over from 1937 to 1942 (and was heard over the air waves on Radio KGW and KEX in “Touchdown Parade” with Father George Dum, C.S.C. and the Gleemen). 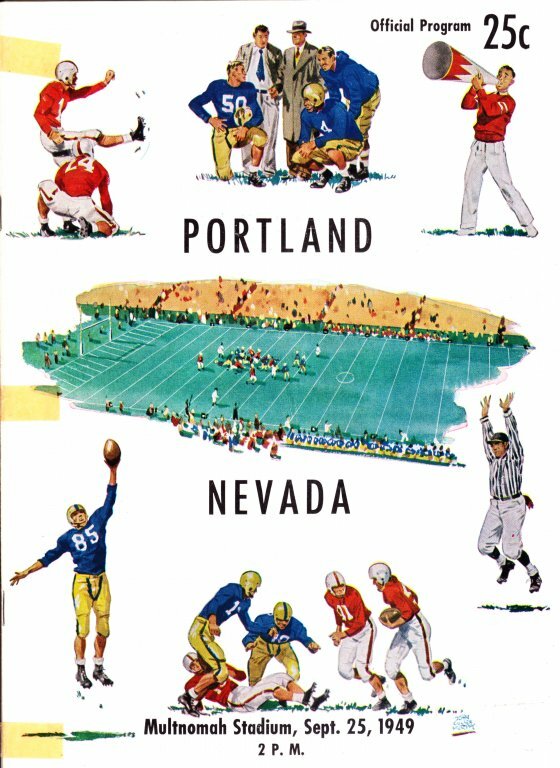 Football on the Bluff was suspended during 1943, 1944, and 1945 because of World War II. 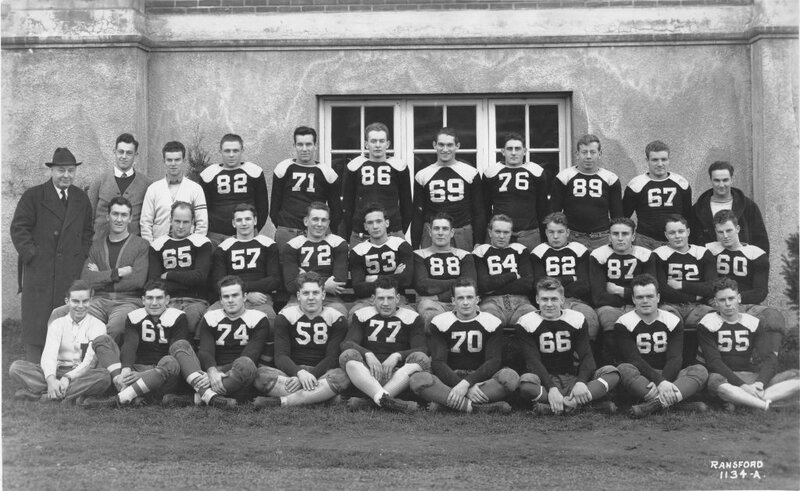 Hal Moe took over for the 1946, 1947, and 1948 seasons, and Harry Wright coached the last year for the “Pilots” in 1949. 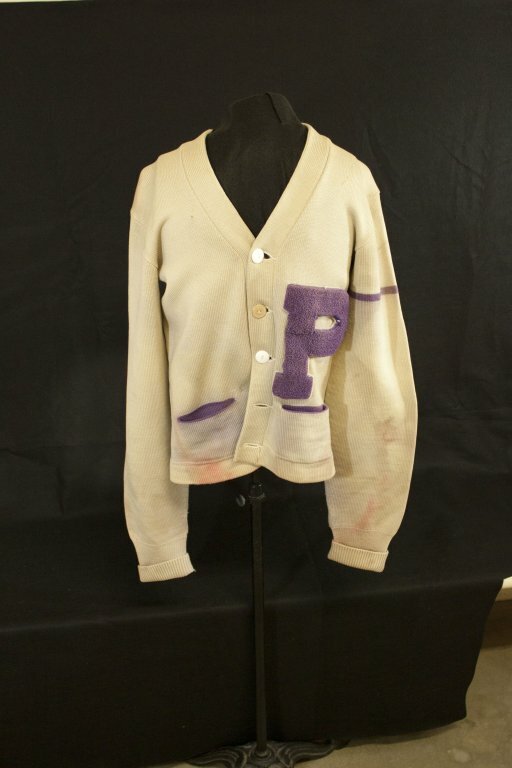 The University Museum in Shipstad Hall brings these days to life through its historical athletic treasures: Karl McDade’s and Emmett Barrett’s football jerseys; Richard Deck’s football shoes from the 1930s; Ray Utz’s football playbook from the late 1940s; football helmets from the 1940s; game football from the Pilots greatest upset win over nationally ranked St. Mary’s Gaels in 1939; game football from one of the last football games in 1949, and more.